Kamera Betrug: Canon Eos 5D Mark II aus Wien oder doch London? Canon Eos 5D Mark II aus Wien oder doch London? 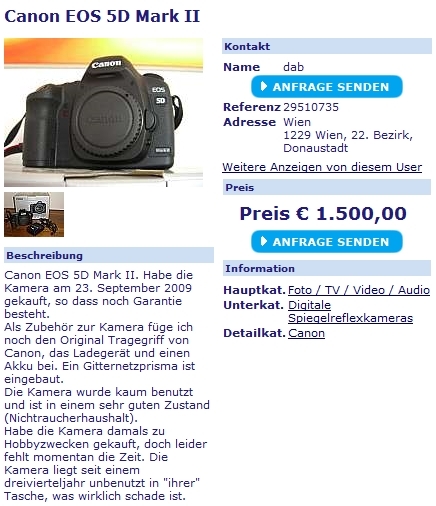 Ein gewisser David Brown (E-Mails: davidbuk21@hotmail.com & davidbrown2000@hotmail.com) offeriert eine Canon Eos 5D Mark II für 1.500 EUR. Artikelstandort ist eigentlich Wien – jedoch stellt sich in der ersten Antwort des „Verkäufers“ heraus, dass er in London lebt. Die Transaktion soll über Orangefield Trust erfolgen. Das klingt alles weniger vertrauenswürdig. Also lasst auch hier lieber die Finger davon! The camera is still available for sale, but first of all I should mention that I live in London, UK. I prefer escrow services for the transaction. This way I'll be able send you the camera and you'll have 5 days to inspect/test it before notifying the escrow company to release the money to me. The transaction will be done through Orangefield Trust and I'll pay for escrow and shipping charges. Please let me know if this is fine with you.